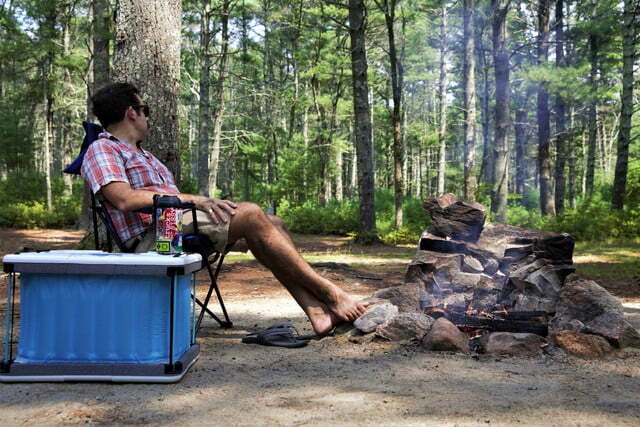 Owning a portable fridge is an essential must have for anybody who enjoys a lengthy camping trip. This highly convenient and very handy piece of camping equipment allows you to take more than just non perishable food items with you on your adventures and can help to make your camping excursions far more enjoyable. What is the best camping fridge? Stick with us and find out as we share all the information you need to know for when buying a camping fridge/freezer in our ultimate buyers guide. If you already know what to look for when choosing a portable fridge then you can check out the top choices in our comparison table below. If this is your first time buying a fridge/freezer for camping then I would highly recommend reading our guide. In there you will find all the information you need to help you to choose the best model for both your camping needs and budget. What Size Camping Fridge Do I Need? The first thing to think about and probably the most important is the size or capacity of the portable fridge you need. Portable camping fridges come in many sizes and the difference in price between sizes is considerable. If you buy one that is way to big for your needs then you will find yourself throwing away quite a large chunk of money. On the opposie end of the spectrum, buy one too small and you will kick yourself for it. Before deciding on a capacity it is best to think about the maximum length of time you will be camping for and how many people there will be going with you. After working out what essential supplies you need for each person during the duration of your camping expedition, you can gauge a rough estimate of the storage capacity you will need. Listed below you can find a bit of information on the capacity of different size portable camping fridges. Hopefully this will help you to roughly estimate the correct maximum capacity for your needs. 25L – A 25L and under fridge/freezer is best suited for a days camping for a small family. 40L – This is the most popular size of camping fridge and you will find a wide variety of brands catering towards this capacity. Ideal for a long weekend away for two or three people, a 40L is a good choice for the majority of campers out there. 50L – A fridge/freezer of this size is capable of providing enough room for the food of two people for a week. 60L – Ideal for a family of four on a five day camping trip. 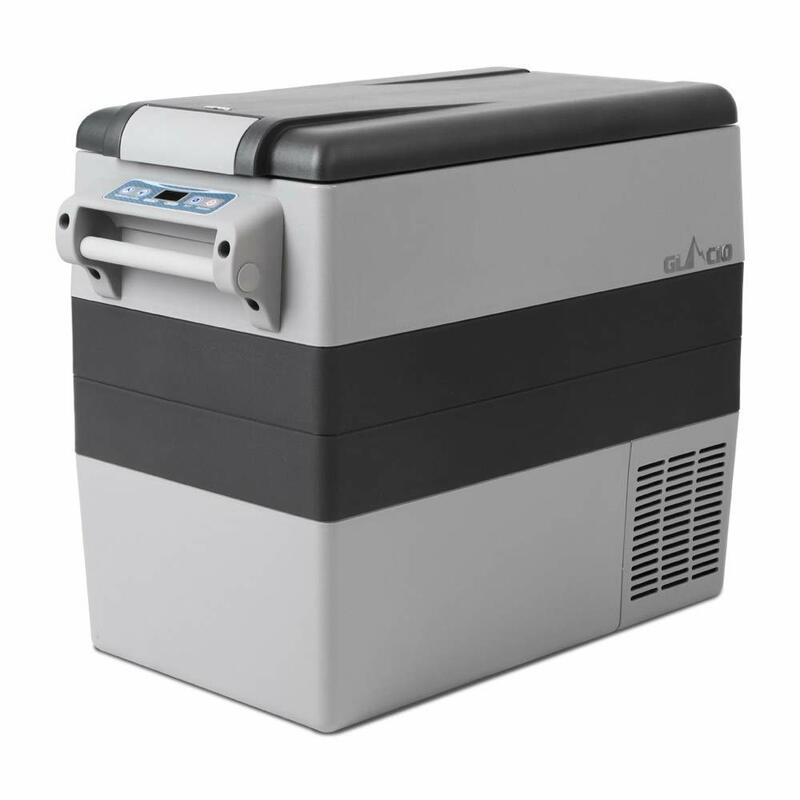 80L+ – When you get to portable fridges of this size you are looking at been able to get away from it all for some considerable time, dependent on the size of your group of course. A family of five should have no trouble storing enough food and drinks for a week or so. If your camping excursions last for more than a day or two then I would highly advise investing in a portable fridge freezer. With both refrigerating and freezing capabilities a portable fridge/freezer is essential for those long camping adventures. The best dual compartment models on the market allow you to use both compartments for either freezing or refrigerating, which is a great convenient feature to have. 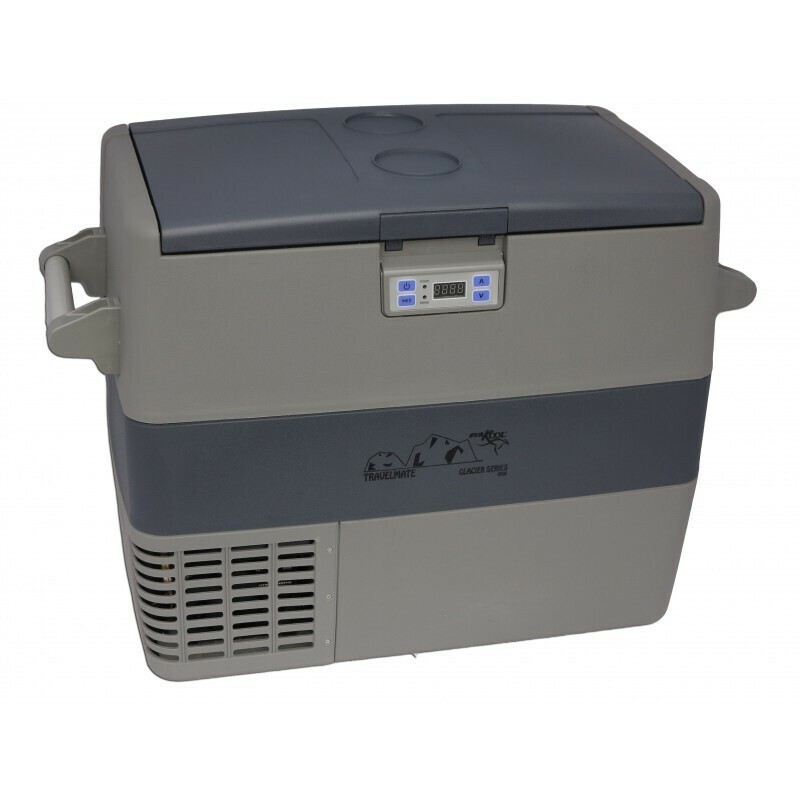 The Adventure Kings 65L Fridge/Freezer is a good example of a model with this function and well worth considering due to the affordable price and excellent customer feedback. It ranks high in many camping fridge reviews and often comes recommended as the best camping fridge freezer. The power drain of a fridge on your vehicles battery is another important purchasing consideration and something that should be given some serious thought. There are two options to power a portable fridge freezer using your vehicles battery. The first method involves using your vehicles starting battery to power your camping fridge and this is the most risky of the two. Deep cycling as this is known can drastically reduce the life of your battery and if you are not careful you will be left with drained battery and possibly stranded. The best way to power a camping fridge and also a lot safer method is to install a dual-battery system. This allows you to run your fridge/freezer from a separate battery, eliminating the risk of draining your starter battery. When buying it is a good idea to choose a portable fridge with a low current draw, especially on 12 volts. In terms of ampage 1 amp is considered low and 5 amps quite high. The built-in compressor is the very heart and soul of your fridge and if it goes wrong you are in trouble. The quality of compressors varies between brands and models quite drastically and is something to be aware of. The best compressors are SECOP, Fuji, Sawa and Waeco. The best fridge freezer for camping can be an expensive purchase costing way over $1000. Bearing this in mind it is recommended that you choose a model with a good warranty. The more expensive choices available come with a warranty of 2 years or more. The best cheap camping fridge will come with a standard 12 month warranty. Now that you know what to look for when buying a camping fridge its time to take a look at our top recommendations. In our camping fridge reviews you will find options suitable for all budgets from the best of premium choices to the best of the more affordable budget models. 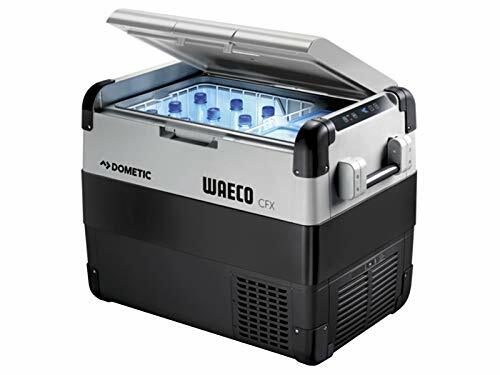 The Dometic Waeco CFX 65w Fridge is an award winning camping fridge that is rigourously put through testing in the extreme heat of the Australian desert. With top of the range features and specifications it comes recommended as our top choice for the best camping fridge. The CFX 65W has some seriously impressive features and with a generous 65L capacity it is suitable for those extended camping trips with the family. Firstly, there’s the CFX Special Electronics which include an intelligent automatic turbo cooler and memory function. Then not only is it suitable for deep freezing down to –22 °C but it can also operate on solar power. Another positive feature is the WiFi capabilites of this fridge/freezer. These allow you to conveniently control and monitor the temperature using your tablet or smartphone via the WiFi app. The Dometic Waeco CFX 65W is a long term investment that is best suited for those that go camping regularly. It comes packed with high quality features and is designed with durability in mind. If you are looking to buy one of the very best models available then look no further. 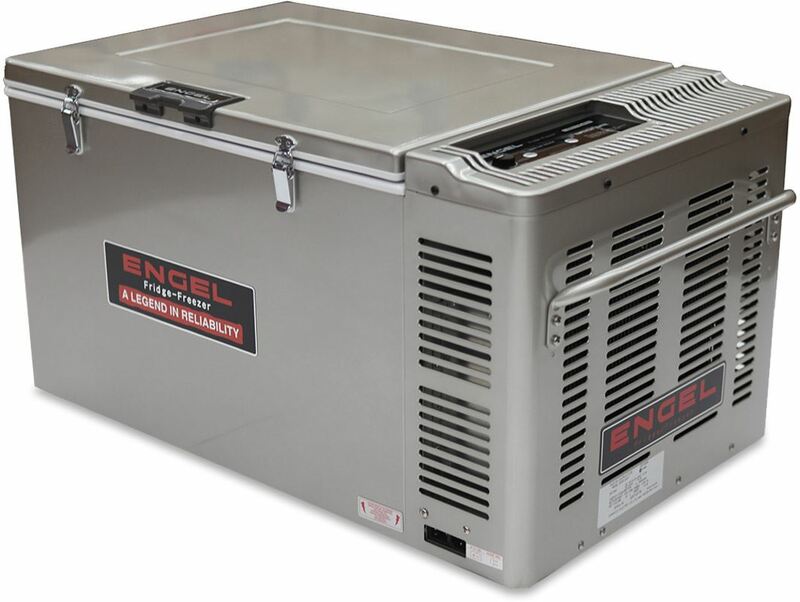 Engel are a brand with a solid reputation among Australian campers and their fridge/freezers are highly prized for their reliability and overall high quality. The Engel 80L Fridge/Freezer is an expensive piece of equipment but it is also quality at its very best. With a very impressive 80L capacity it can adequately store enough food for a weeks family camping. The overall build is highly durable which is down to the steel construction and with a 3 year warranty you can be safe in knowing that this is a very well-built portable fridge. For convenience it can be used as either a refrigerator or freezer which is a very handy feature to have. It also has both a 12 volt cord that plugs straight into your vehicle’s cigarette socket and a 240 volt lead with three pin plug. 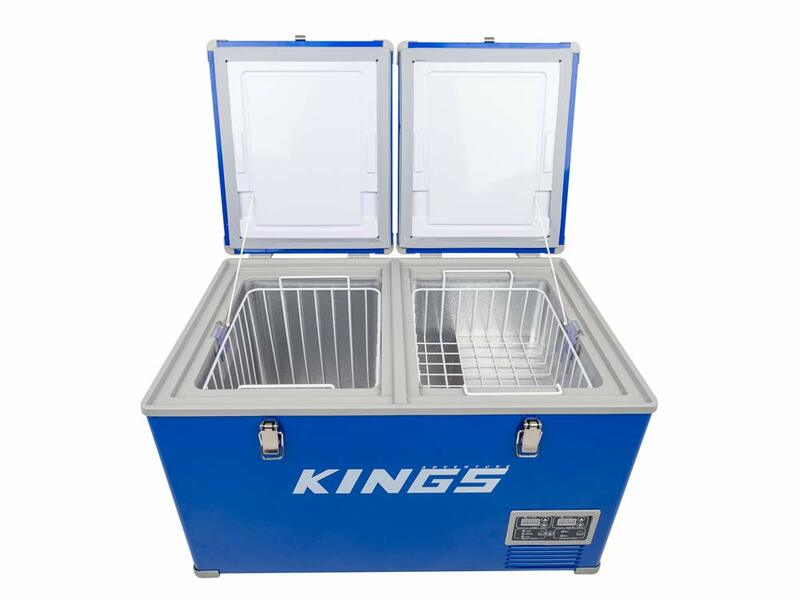 The Adventure kings range of portable fridge/freezers are very popular among campers in Australia and it’s not hard to see why, as they are reasonably priced and built to a very high standard. The Adventure Kings 65L is a dual-zone fridge/freezer that uses a genuine Secop BD-50 compressor and can run on 12V, 24V and 240V. When compared to most other choices available the Adventure Kings range is limited in terms of modern features, there are none! That been said, if you are looking to buy a robust and durable portable fridge you are in luck. Adventure kings fridge/freezers are very popular despite the fact they lack the modern features that most models come with. If you are looking for a durable designed portable fridge then it is a good choice, however, there are better options available with the Evakool Glacier range of fridge/freezers been one. If you are looking for value for money when choosing a camping fridge you would struggle to do better than the EvaKool TMX50. This mid-price portable fridge is a bargain as it comes with many of the high quality features that you normally only get with far more expensive models, such as the ones we have already mentioned in our reviews. To start off the fact it comes with a SECOP compressor is a big positive. Then there is the Wifi connectivity and USB port which are both unexpected for a portable fridge of this price. For convenience and easy access the top can be opened from both the front and side. This allows for a range of setups depending on your vehicle type and space available. There are a few customer reviews complaining that the basket has gaps that allow smaller food items to fall through. The Evakool Glacier is a great choice for many campers and it comes in at a price that is hard to beat. Furthermore the 5 year warranty is a good sign of just how confident Evakool are about the durability of their fridge/freezers. If you are looking for a quality model with excellent features at a good price then this is the one for you. You can view the full range of Evakool fridge/freezers on Amazon where we found them to be the priced lower than anywhere else. If you are on a limited budget there are a good number of portable fridge freezers to choose from the problem with this is that not all of them are up to the standard needed. The Glacio Camping Portable Fridge/Freezer is one exception that has a good degree of quality to it. The overall design is fairly basic as there is no Wifi connectivity or USB port, which is to be expected considering the affordable price. In terms of durability the Glacio is very solid and robust though and features a powerful compressor that allows for a minimum temperature of -18 degrees. This is by no means the best fridge for camping available in Australia, but it is the best of the budget models and well worth considering if you are looking for an affordable option. If your budget can stretch a little bit further, I would advise investing in an Evakool model as they don’t cost that much more but the extra quality and features they have are worth the added cost. When buying a fridge for camping you don’t have to spend over the odds as there are a good number of affordable models that have many of the features of the best camping fridge. Hope fully with the help of our buyers guide and reviews you found what you were looking for. If a portable fridge is not for you then be sure to check out our guide to choosing an Esky for camping.